I grew up very much the tomboy. Although I had an interest in clothing and being pretty, I had even more of an interest in playing Star Wars with my friends, or swimming in the pool after school. I was never one to spend time gossiping with girls at recess, but could be found on the handball courts, or playing in the school yard with the boys. That’s been pretty much me all my life. I bought clothes that I liked, could go with anything, that I could wear to work and out with friends because I just could never afford two wardrobes. Anything that made me drool I couldn’t afford, so clothes has never really been a priority other than looking respectable at work. Shoes? HATE shoes. Never liked them. I was in detention almost every day after school from Junior High on because I would be caught running around barefoot. I was called “Detention Barbie” because I would let people play with my hair. Detention for me was pure bliss, because I love it when people play with my hair. My mom got so sick of me being in detention, and buying me shoes that I promised that I would keep on my feet (which lasted about a week), that she got special permission from the high school I went to for me to wear moccasins (which were not permitted) instead of regular shoes because they were the only shoes I would actually keep on my feet. The school agreed as long as we could find moccasins that were hard soled. We did. After high school I swore I would never wear shoes again, and I didn’t for about a year. There were the exceptions of movie theaters, pool halls, and restaurants, but I wore fake burkenstocks (payless brand) so as soon as I was in, the shoes came off. Except at the movie theaters. Gross! By the end of the year the bottoms of my feet were very hard, and very shiny. They were like hard, polished leather, if that makes any sense. After that year I got a job in a warehouse and my shoeless days were over. I still like to run around barefoot as much as possible. 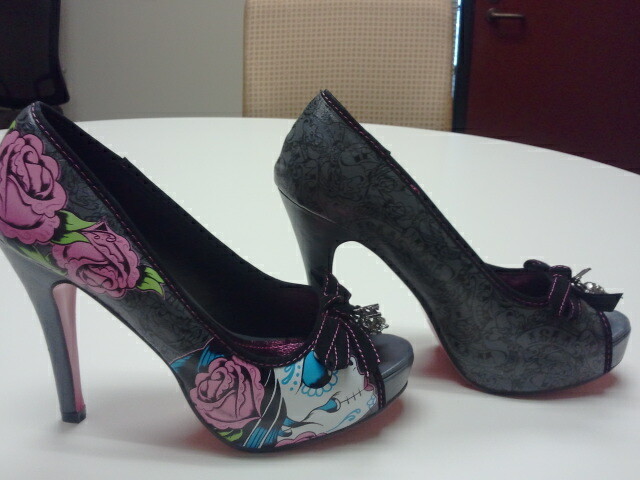 I tell you this so you will understand the magnitude of this statement: I have fallen in love with shoes. Aren’t they gorgeous? They’re platforms so, although I’m not used to wearing heels, they aren’t as high as they appear. The shoes are actually quite comfortable as well, which shocked me. There are three charms at the toe: a rose, a skull, and IF for the maker of the shoes: Iron Fist. Now, they make clothes as well but there are actually only a couple of items that I would be interested in wearing, but I love the shoes. I’ve already created a mental list of the shoes that I intend to buy when I can afford it, and as the shoes aren’t incredibly expensive, I can afford them every once in a while. 🙂 YAY! This entry was posted in Uncategorized and tagged heels, Iron Fist, Shoes, shopping, tomboy. Bookmark the permalink.